We kept score at sporting events in Pumphrey. There were winners and losers. Such is real life. Rev. Lemon was pastor of the Baptist church. My dad, Rev. Lloyd E. Marcus, was pastor of the Methodist church. Pete was my mom's homosexual hairdresser. Mom and Pete were good friends. Pete would never think of demanding that my mom approve of his homosexual lifestyle. Dad treated everyone with respect. Local drunkards we called "wine-os" were guardians of my four younger siblings and me. A wine-o would say, "Hey, that's Rev. Moccasin's (Marcus) kid, don't mess with 'em!" Last night at the Ted Cruz rally in Louisiana with 2,500 people, I felt like I was at a community event in Pumphrey 40 years ago – a revival meeting of traditional American principles and values. A local pastor opened the rally with a prayer, ending it with, "In Jesus name, Amen." Folks, that is becoming unheard of in today's America. My wife Mary noticed that when the audience said the Pledge of Allegiance, four kids around 9 and younger placed their hands over their hearts and knew all the words. Folks, I realized that even I have been trained by the Left regarding what Christians are allowed to say publicly. Hearing Phil talk so freely about old-fashion principles and values with clear boundaries of right and wrong was almost shocking. It heightened my respect for Ted Cruz for having Phil as his opening act. I thought, surely the mainstream media is going to rip Cruz a new one for all this morality and God talk. Cruz's bold, unapologetic commitment to restoring the principles and values of my "Pumphrey" America reinforced my commitment to do everything in my power to put this remarkable man of God, character, and our Constitution into the Oval Office. This is it, folks. Cruz is our one last chance, for Lord knows how long, to take back our country. With a rock-solid record of keeping his word, Cruz vows not to compromise or negotiate away our religious liberty or betray the Constitution. Our Conservative Campaign Committee team has been following the Cruz campaign from state to state, beginning in Iowa. Yes, as chairman of CCC, I would like to take credit for Cruz's victory. However, the truth is, patriots coming together across America made it happen. After traveling and waving signs on street corners all day, our team was pretty dead when we arrived at the Cruz rally in Mandeville, Louisiana. However, the crowd's electrifying enthusiasm for Cruz energized us. 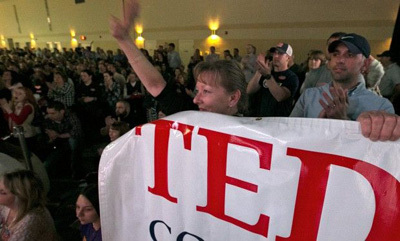 My wife Mary and I stood for 3 hours at the front of the packed gymnasium holding our famous 6 foot "Ted Cruz: Conservative Hero" banner. And ladies, Mary was wearing heels.